Heber City council recently rescinded some previous council actions at the Heber Valley Airport in order to clear the way for a new Airport Master Plan process. In 2017 Heber City adopted new airport minimum standards which would allow for a second Fixed Base Operator or FBO to be at the airport as well as the creation of a self-fuel service operation. 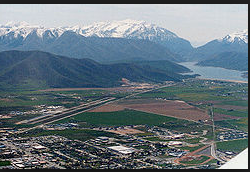 Within a month after passing the airport minimum standards the Heber Airport’s only Fixed Base Operator OK3 Air sued the city. Since that time the city and OK3 Air have been in legal battles. At the last Heber City Council meeting the council rescinded the 2017 airport minimum standards in favor of the previous airport minimum standards in order to create a new master plan. As we have reported the latest Airport Manager report emphasized that the Master plan outcome is not predetermined and is not a license for expansion. City Manager Matt Brower explains why rescinding the 2017 minimum standards are necessary. In the same meeting the council also placed a moratorium, suspending all consideration of development and new commercial activities until the completion of a new Master Plan. The decision did not come without pushback. The Aircraft Owners and Pilots Association opposed the action. The organization says it’s the world’s largest community of pilots. General Counsel and Executive Vice President for the association, Ken Mead, wrote a letter to the Heber City Council. The letter says in part. The letter also questioned the city’s claim that the Federal Aviation Administration or FAA supported the plan. At the council meeting Brower shared a legal memo prepared by legal counsel that has spoken with FAA representatives. The memo states that the FAA supports the city council action given the particular facts and given council’s commitment to complete the Master Plan in a timely manner. The FAA further advises that the Master Plan should not consider rates and charges or the financial feasibility of a second Fixed Base Officer, as both actions are prohibited by Master Plans. It does say however that the city can look at rates and charges independently of, but simultaneously with, the Master Plan. With the respect to the site for a second FBO, the Master Plan can evaluate the feasibility of the location. In other airport related items, After 24-months as Heber Airport Manager, Dennis Godfrey accepted a new position in Boulder Colorado. The Assistant Airport Manager Travis Biggs will be recommended for promotion to the Airport’s Manager at Tuesday’s City Council meeting. Heber City’s Airport Advisory Board meets Wednesday. As part of the meeting the board will hear a report that includes an update on the Airport Master Plan. The Airport Advisory Board meets Wednesday at 4:00 pm in the Heber City Council Chambers in the Wasatch Stake Tabernacle located at 75 North Main Street. The board meets quarterly with the purpose to advise the City Council on matters pertaining to the policies of the Heber Valley Airport.